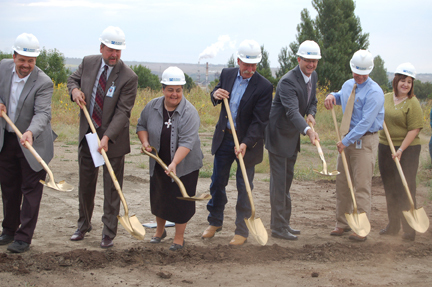 Prioress Sister Nancy Miller, and Sisters of Annunciation Monastery, joined St. Alexius Medical Center President and CEO, Gary P. Miller and Chair of the St. Alexius Board, John Castleberry and others for the groundbreaking and blessing ceremony for the future St. Alexius Mandan Clinic. The two-story 22,000-square-foot facility will be located at the intersection of Sunset Drive and the Old Red Trail, Mandan. The clinic is expected to open in early 2014. The facility will include imaging such as diagnostic radiology, MRIs, CTs, ultrasound, mammongraphy and Dexa Scan, as well as laboratory, selected rehabilitation services and pharmacy. Gary P. Miller, President and CEO of St. Alexius, said the hospital purchased the land five years ago with the expectation that Mandan would grow. The Benedictine Sisters of Annunciation Monastery, and sponsors of St. Alexius Medical Center, have been leaders in healthcare since opening the region's first hospital on the Dakota prairies in 1885. The mission to "Let all be received as Christ," is alive and growing with the growing healthcare needs of this region.